One of the most bizarre places I’ve ever been to is the town of Gori in Central Georgia. It is strewn with the history of invaders and occupying forces. Situated on the crossroads of major ancient routes, it is surrounded by Iron Age remains and ancient churches. However, Gori only became a noteworthy destination on the tourist trail in the last 30 years and for a rather unusual reason: this the birthplace Joseph Stalin, the leader of the former Soviet Union. 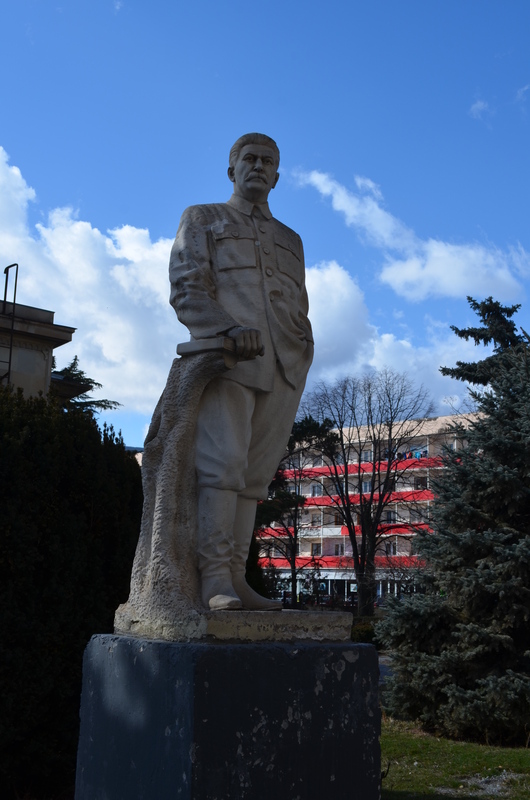 Indeed, Gori is probably the only Stalinist town left in the world and this makes it a fascinating town to visit . Gori attracts pilgrims who are still devoted to Georgia’s Man Of Steel. There are supporters of Stalin amongst the locals of Gori, including one obsessed fan who is known for his collection of Stalin’s used cigar butts. Whatever your opinion may be on the Soviet Union and its human rights record or the cult of Stalin a little cultural sensitivity is in order when visiting Gori, which is rather like Mecca for stalwart communists. It would be wise not to criticise Joseph Stalin whilst visiting his hometown lest you upset one of his admirers. Getting to Gori is half the fun and the trip is quite beautiful. This town is an easy day trip from Georgia’s capital, Tbilisi. The easiest way to get to Gori is by private local minibus, known as a marshrukta; be aware that marshrutkas can become overcrowded, only setting off for its destination when full. However, this is the local way and are something of an experience. These minibuses leave from Didube bus station in Tbilisi whenever they are full, which is about once an hour. It’s best to get there by 9 am as you may have to wait 20-40 minutes. Expect a journey of around 90 minutes, costing only 4 GEL ($1.95 USD) per person. 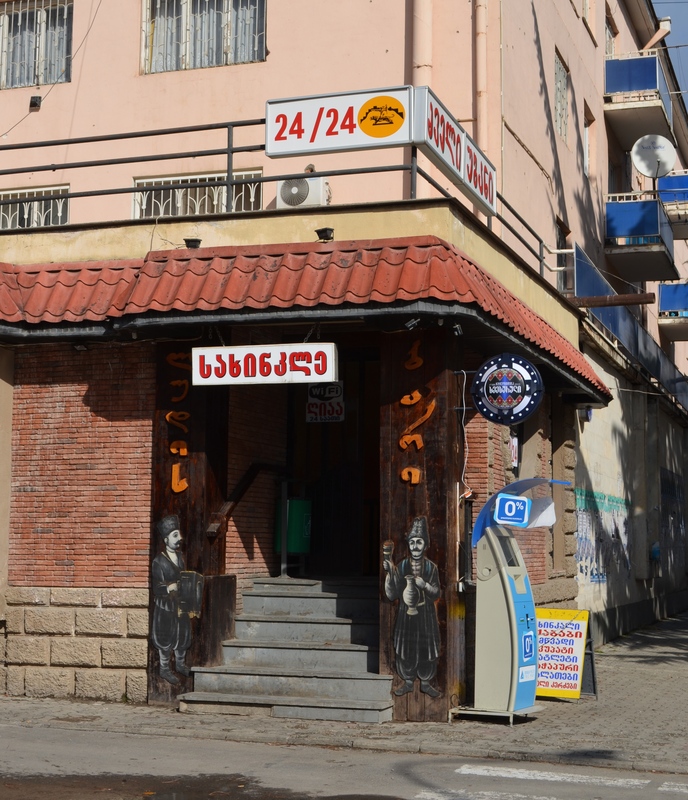 To get back to Tbilisi at the end of the day, just ask around at Gori bus station for the next departing marshrutka, approximately every half hour. If you prefer to travel in comfort, you can hire a taxi or rental car. 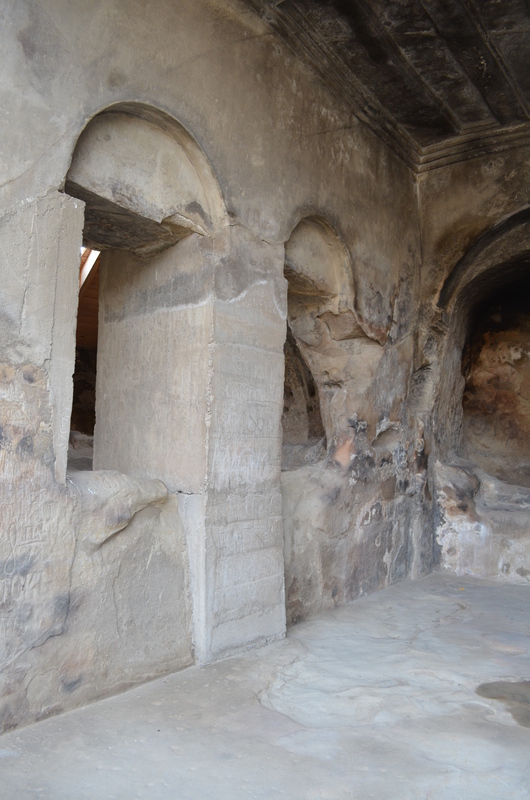 The ancient city is awash with history, providing some spectacular sights and places of cultural interest. The most interesting site of all is the Joseph Stalin Museum, including the house in which Stalin was born and even a gift shop – Yes, a Stalinist gift shop! The complex appears to be less of a museum and more of a shrine to Joseph Stalin, one-time leader of the Soviet Union. The Stalin Museum. Homeless children get free entry! The first building is the small, modest dwelling where Stalin was born as Iosif Vissarionovich Dzhugashvili and lived in until he was four. 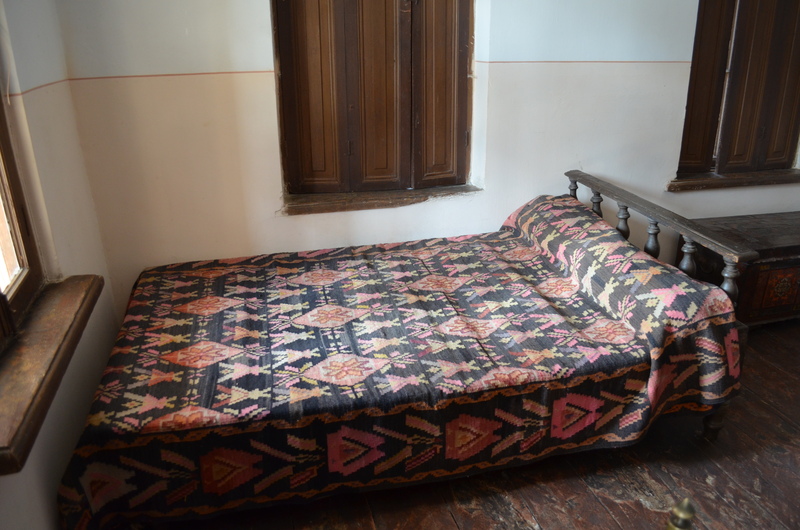 Apparently, all the furnishings are original – although seeing as the family moved several times from one cheap lodging to another it’s a mystery as to how all the original household items have remained. This house was a place of misery for the Dzhugashvili family, as Stalin’s dad was an alcoholic who beat his wife and their only surviving child. Take heed: when you abuse kids they may turn out to be dictators and mass murderers. The main museum is a palatial, neoclassical edifice with colonnades and chandeliers. 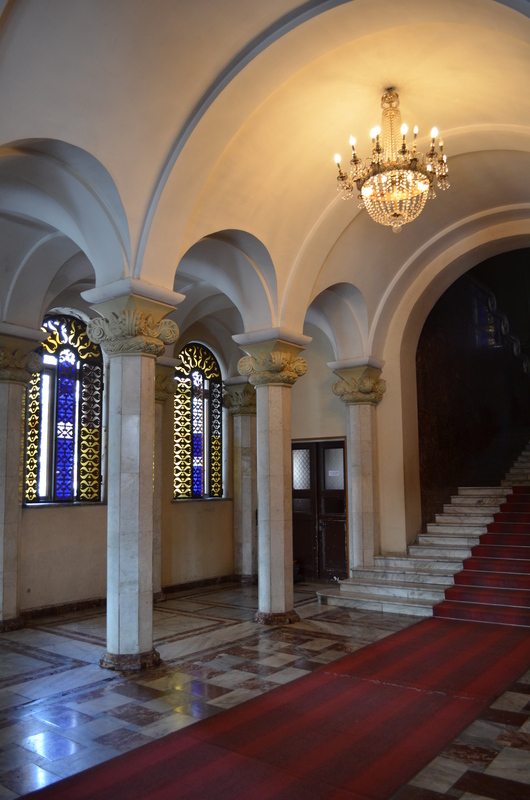 This building, dating from 1957, contains six halls which showcase Stalin’s personal belongings such as his ashtrays and favourite cigarettes; his Kremlin office furniture; gifts from countless foreign heads of state; samples of his meticulously neat handwriting. Also on display are newspaper articles, original Stalinist propaganda art and photos and other frightening relics of his cult of personality. 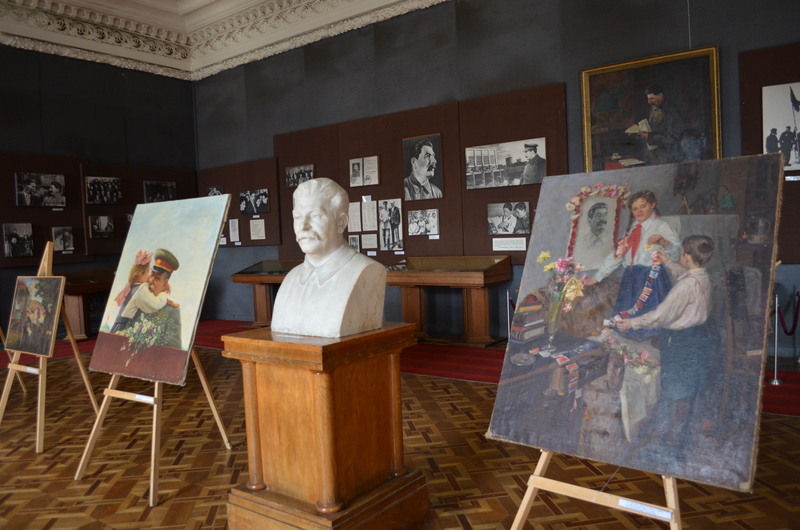 As the museum was accused of glorifying Stalinism, a new section was open to appease the many Georgians who protested the existence of the Joseph Stalin Museum. A tiny room underneath the sizeable museum is dedicated to, as our guide put it “the negative aspects of the Soviet Union” featuring a mock interrogation room and holding cell. 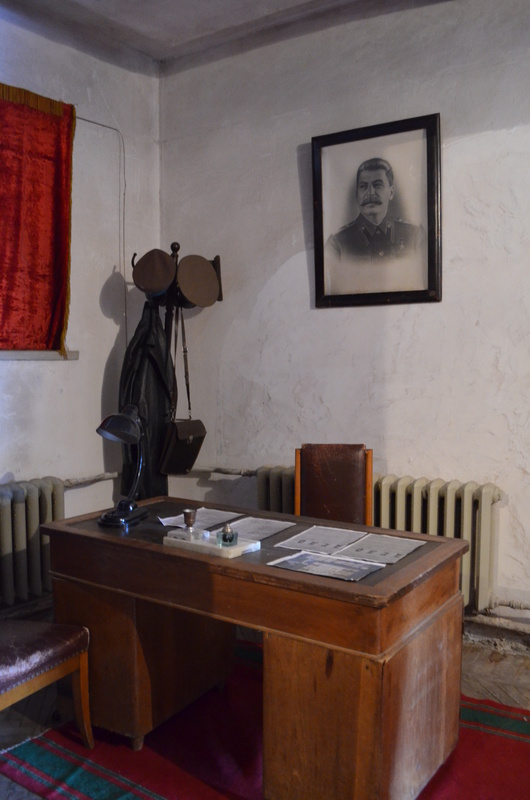 A replica of Soviet interrogation rooms – look who’s smiling down on us from the portrait! Families of the victims of Stalin’s regime have donated items for this room, although it is still the smallest section of the museum. Outside of the museum is Stalin’s personal railway carriage, used to transport him to conferences. The Marshal of the Soviet Union disliked air travel, so he spent a great deal of time in his opulent carriage with its bullet proof windows, air-conditioning and a full sized bath. As you walk through the comfortable carriage, one can imagine him luxuriating in the salon, sipping his beloved Kindzmarauli wine as he whizzed passed the villages of starving peasants. The museum is a 5 -10 minute walk from the bus station at 32 Joseph Stalin Ave (street signs are written in English) and any local will be able to direct you to the museum from the bus station. Even if they don’t speak English you’ll find that Georgian people are friendly and helpful. 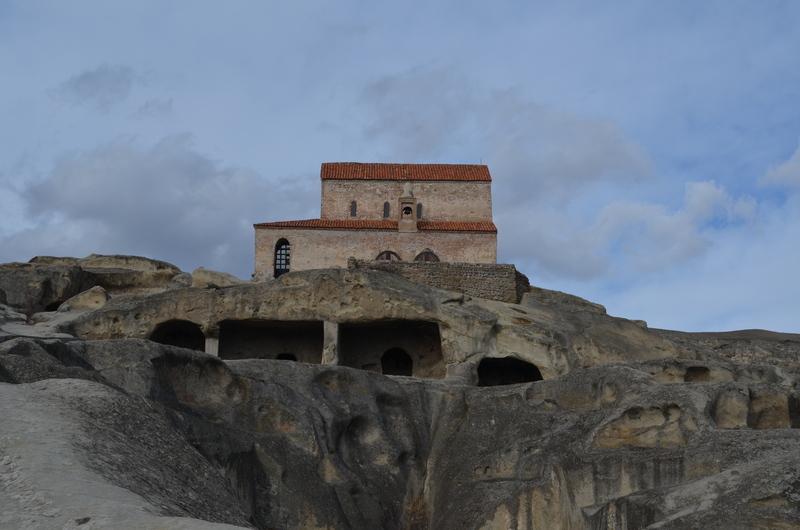 The ancient town of Uplistsikhe has long been overlooked by Gori’s Stalinist relics but it is an extraordinary ancient city only 10 minutes drive from Gori. Uplistsikhe, meaning “The Fortress of the Lord” is a town of carved out of the rock that is being restored as a UNESCO World Heritage Site. Uplistsikhe dates from the early Iron Age and is one of the oldest settlements in Georgia. The remains of this site, abandoned in the middle ages, include an amphitheatre; a throne room and wine cellar; rock-cut dwellings and stairways leading to ancient temples. Several Christian and Pagan temples have been found on the site. Artefacts are regularly being unearthed here. The basilica built on top of an ancient Pagan temple. 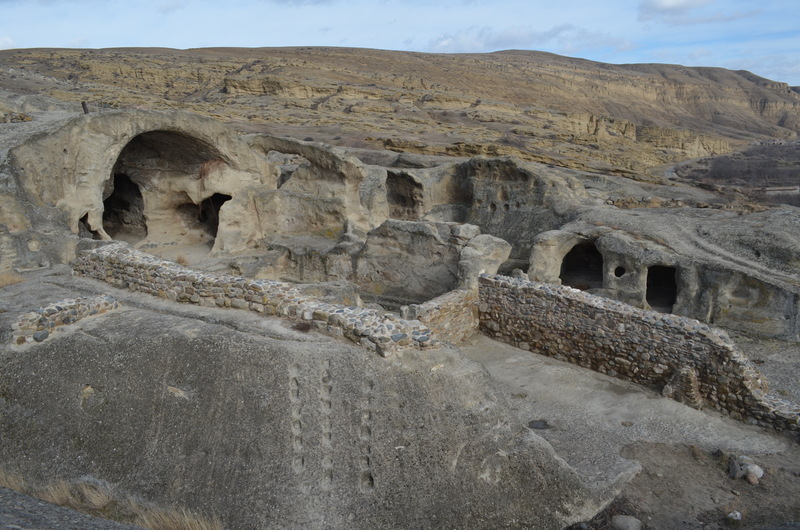 Uplistsikhe was the most important town in the region from the 4th century BC, it thrived for 800 years. The town experienced a revival again around the 10th century as a holy place for Christians and a centre of wine production. The magnificent Basilica is built over a pagan temple which is yet to be unearthed. The entrance to this archaeological site is 10 GEL. At this time the transportation from Gori to Uplistsikhe isn’t developed. There are rumours of a bus but we had no idea how to manage it as there was no information in English. You can hire a taxi to take you to and from the site, we asked the taxi to wait 2 hours for us, the cost was around 40 GEL for two people. Perhaps this fare was expensive by local standards but it was worth every penny. Gori Javi – the church, and its cross, can be seen from almost anywhere in Gori. The current church built in the 1980s stands on the site of the original, dating back to the 12th century, which was destroyed by the Turks. Reaching the church requires a moderate hike, which take around three hours to go there and back; you will be well rewarded for your efforts with a most stunning view of Gori and the Georgian landscape. Head to a local restaurant for lunch. If you are looking for an unforgettable dining experience, walk to El Depo at 19 Stalin Ave, right near the Stalin Museum. The name was a mystery to me as it’s written in Georgian, except for one sign that says “24/24” and you will recognise the building as it is on a corner. You can’t miss it, look for the 24/24 sign. El Depo even has a band playing loud live music from 1.30pm in the afternoon, it’s quite lively and at least half of the clientele are drunk. Most of these people are middle aged or retirees during the day time and they are great: people certainly know how to have fun in Gori. Bathrooms are rather rustic; the live band plays popular folk songs and recent Russian and Georgian pop songs. The food is traditional, wholesome and delicious. Fresh soups, barbecued meat and schnitzels are available – at any time of the day or night. The khinkhali dumplings are delicious. 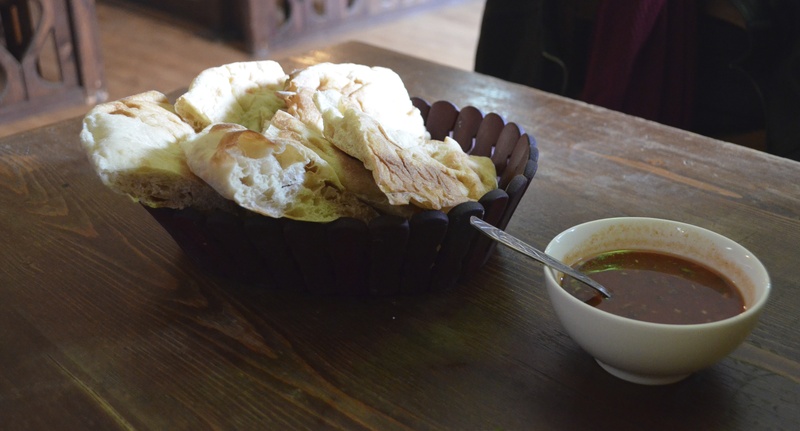 Georgian food is delicious, I was especially fond of the bread at El Depo which came with a homemade dipping sauce. Georgia’s fine Kindzmarauli was Stalin’s favourite tipple, a dark red, semi-sweet wine sought after by aficionados around the world. Kindzmarauli is sold in most bars, corner stores and restaurants. Gori is surrounded by vineyards. On the road between Gori and Uplistsihke there are vineyards open to tourists (depending on the time of the year) and you can even grab a 15 GEL ($8USD) from a local store and it will be fantastic. Fit for a king, or at least a Soviet leader. Thank you, Annie. Try some Georgian food if you get the chance, it’s underrated.